Very clean, comfy, great breakfast and location. Staff was friendly. Two free beers every night is a great way to meet others. Nothing bad to say about this place, definitely would stay again! Really nice hostel and very clean. Lovely staff. Breakfast is pretty descent. The location is great. Only stayed for one night and didn’t spend much time there so I don’t know if it’s easy to meet people or not but pretty sure it is as the common areas are downstairs where everyone has to go through. Stayed in a private room, air con worked perfectly, everything was clean and the size of the room was great. 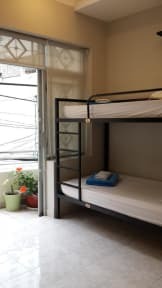 Great location in backpacker district, walking distance to central landmarks, staff super friendly they even let us keep our bags in their storage room for our entire last day after check out and let us take showers, free breakfast is superb (juice, coffee, banana pancake and choice of egg in bread). My boyfriend and I stayed in a private room for 2 nights. We stayed on the 4th floor which was a bit of a climb but doable. The room was comfortable and clean, but the location wasn’t close to anything significant. What made this place was how amazing the staff working there were - they were very friendly and extremely helpful with any questions we had. They didn’t hesitate to help which was amazing. The included breakfast was also great. Plus: good location, good breakfest, free beer in happy hour. Minus: no shower gel in The bathroom, staff speakes poor English. Nice atmosphere with happy hour with 2 free beers which gathers the travellers in the common area to socialize. 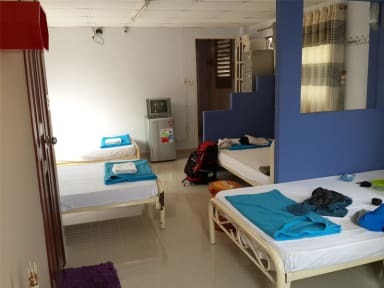 Hostel has all that you need, facilities were clean, it was in a good location. There was a communal area where you could hang out, but it wasn't a super lively atmosphere that you would find at a party hostel. Good place for a chill stay. We really enjoyed or stay at Long Hostel. As the Hostel is located in a small and quite calm street, but the “Backpacker Street” is just around the corner, for us the location was perfect. Also the atmosphere at the small but cosy relaxing area was really nice and we met there many new friends. Our room was rather clean and also the stuff was really nice and always helpful.